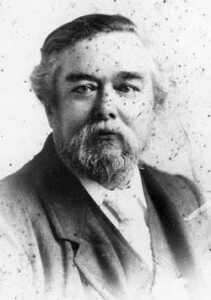 Tewkesburian Thomas Walker was born in 1846, the son of a local business man, and was educated here before taking up an apprenticeship in engineering. 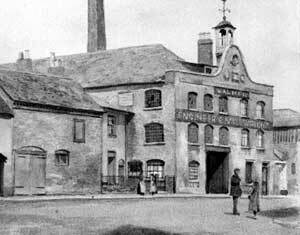 Upon completion of his training, he decided to go into the engineering business on his own account, and in 1868 set himself up in a small yard in the Back of Avon in Tewkesbury. Specialising in the repair and maintenance of agricultural machinery and steam engines, the business prospered and soon took on its first employees, and by the end of the decade was seeking larger premises. These were found in Tewkesbury at the old candle factory at the junction of Wall’s Court and the Oldbury Road, and the move made in 1871. At the same time the adjacent Bleach Yard, and a few adjoining cottages were taken on. The business continued to prosper, and following the introduction of a new line of business-the repair of Showman’s equipment, ambitions were turning towards the manufacture of primary equipment. To achieve this additional premises, the adjacent old theatre building, was purchased in 1881, and now with a greatly increased work force the design of a range of agricultural and commercial machinery was commenced. The business from showmen continued, and a range of fairground rides were added to the company’s portfolio, resulting in the award of Walker’s first British Patent in 1887 for their design of a galloping motion for roundabout animals. Further patents were awarded before the end of the century, and the fairground rides were becoming the principle activity of the company. During the early 1900’s the number of employees had again increased, and the range of products included swingboats, racing motors, merry-go-rounds, galloping horses, switchbacks, and coasters. 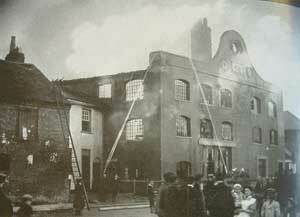 During 1905 helter-skelters were included, whilst 1908 saw the introduction of the popular cake-walk ride, but disaster intervened in September 1912 when the main workshops and offices were destroyed by fire, including machines under construction for customers and all of the company’s patterns. Ever resourceful, Thomas and his sons set to and built a new factory in the yard adjacent to the Trinity Church. Further misfortune occurred in July 1912, with the sudden death of the founder, Thomas Walker, but the business continued under the directorship of Mrs. Mary Walker and her sons John and Alfred. 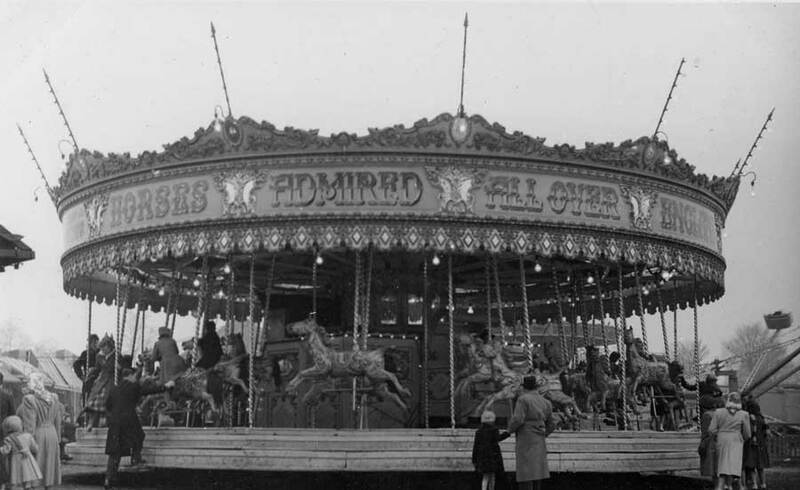 All riding machines were supplied to the customer’s specification ranging from a plain machine, or plain painted, to complete with all the carvings, cornices and showboards, twisted brass, and fully decorated. The company employed its own carvers producing the ornate showboards and animals, and also utilised outside suppliers of these parts, notably Anderson’s of Bristol and Lines Brothers of London. From 1920 the traditional rides were beginning to decline in popularity, with the much faster chair-o-planes showing the way ahead. With this machine, and the introduction of the futuristic Tobogaboo ride followed by the Over-the-Falls, and the continuing popularity of the Cake-walk, the future of Walkers appeared to be assured. However this was not to be, for in 1924 the company suffered a severe cash-flow problem, and by February 1925 was in the hands of the receivers. This ended over fifty years of endeavour and enterprise.